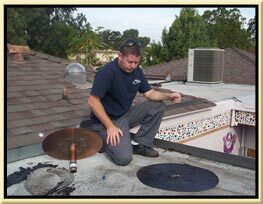 Laguna Niguel Roofing does commercial roofing and repair for Laguna Niguel and all of Orange County. Our services include routine maintenance, professional roof leak detection, use of infrared camera, ponding water problems, flashing services and replacement, annual maintenance planning, roof coatings, split seams, drain sealing, and general clean-up. South County Roofing and Commercial roof repair can fix just about any type of roof leak you may have on your commercial building. We routinely work on concrete tile roofs, repair Spanish clay roofing tiles, low sloped roofs, rock or gravel covered flat roofs, and asphalt composition roofs as well. Call us today for a free commercial roof leak repair estimate! Call us before the rainy season and to get your roof cleaned up.